The seventh edition of ‘Ganga-Jamuna Cultural Festival’ (Ganga-Jamuna Sangskritik Ustab 2018) begun on the premises of Bangladesh Shilpakala Academy (BSA) on Friday in the capital’s Segun Bagicha area. Eminent theatre personality Bivas Chakraborty from India and Mamunur Rashid from Bangladesh jointly inaugurate the 11-day theatre festival at Theatre Hall of BSA at 05:00pm on the day. Presided over by convener of festival organising committee Golam Kuddus, Cultural Affairs Minister Asaduzzaman Noor was present the occasion as chief guest. Veteran theatre personality Ataur Rahman, Nasiruddin Yousuff and Liaquat Ali Lucky were also present at the inaugural ceremony as the special guests. 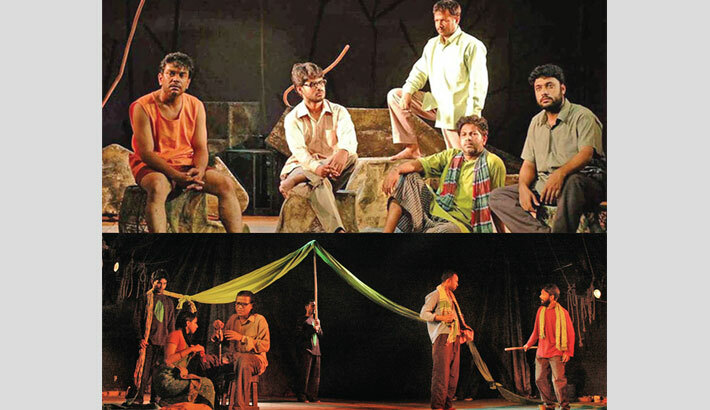 Yesterday, on the second day of the festival, Theatre, one of the most popular theatre troupes in the country staged its much-acclaimed play ‘Meraj Fokirer Ma’ at 7pm at the Experimental Theatre Hall of BSA, while Kolkata based theatre troupe Aneek staged its new play ‘Bish Ghum’ at the National Theatre Hall. Today, on the third day of the festival, Theatre Art Unit, will stage its much acclaimed production Somoer Proojone at the Experimental Theatre Hall of BSA at 07:00pm. ‘Somoyer Proyojone’ had been dramatised and instructed by Mohammad Bari. Based on a short story of Zahir Raihan, the play was premiered on July 23, 2005. Zahir Raihan wrote the story in the year 1971. The story of the drama revolves around a freedom fighter. His experience and the emotional journey bring back the horrific situation of Liberation War. The story vividly portrays the experiences and the emotional journey of a freedom fighter in the ongoing war. The story has been narrated in a more or less linear structure. While, theatre troupe Prachayanut will stage its popular play A Man for All Seasons at the National Theatre Hall. The original script of A Man for All Seasons was written by the British playwright Robert Bolt, while Shahed Iqbal translated it into Bengali. Celebrated thespian Azad Abul Kalam has directed the play. The play is about the life and times of Sir Thomas More ─ member of the Privy Council, Speaker of House of Commons, and Chancellor of the Exchequer ─ who was ultimately decapitated at the order of Henry VIII. Through a portrayal of Sir Thomas’ public duty, spiritual quest and private agonies the play foreshadows the hero’s canonisation by the Roman Catholic Church in 1935.